First, it was the CRF450RX, now we have its little brother, the 2019 Honda CRF250RX, a bike designed for the serious off-roader who still wants to have fun. 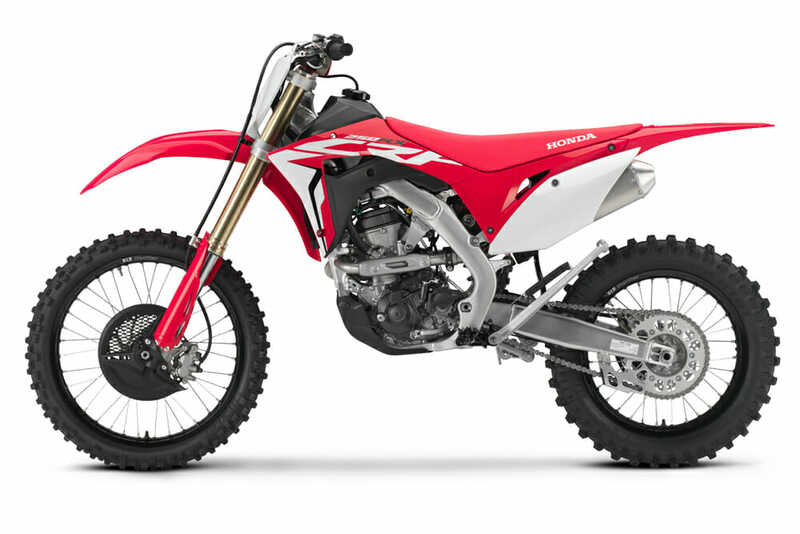 Honda’s answer to the Yamaha YZ250FX and KTM 250 XC-F, among others, is its all-new CRF250RX. 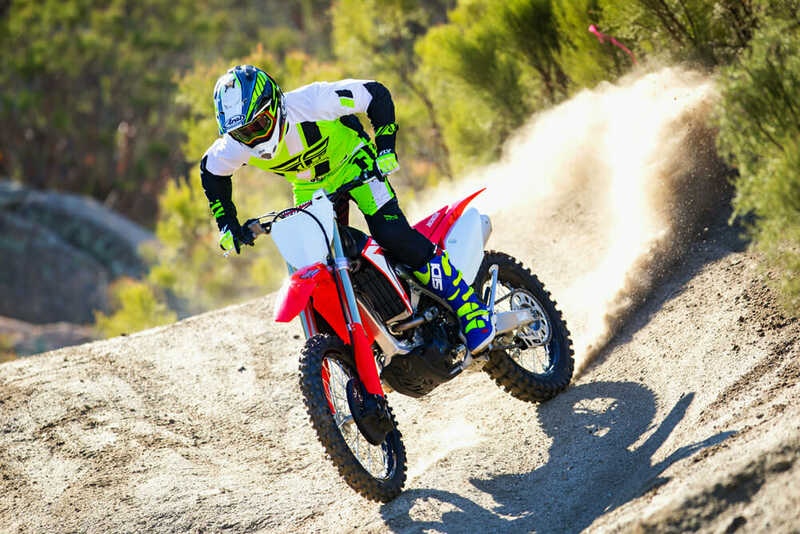 This 2019 Honda CRF250RX Review wraps up a whirlwind season of new-bike introductions by Honda’s full-size motorcycle department. Honda has been busy! Did they save the best bike in their competitive lineup for last? They just might have. 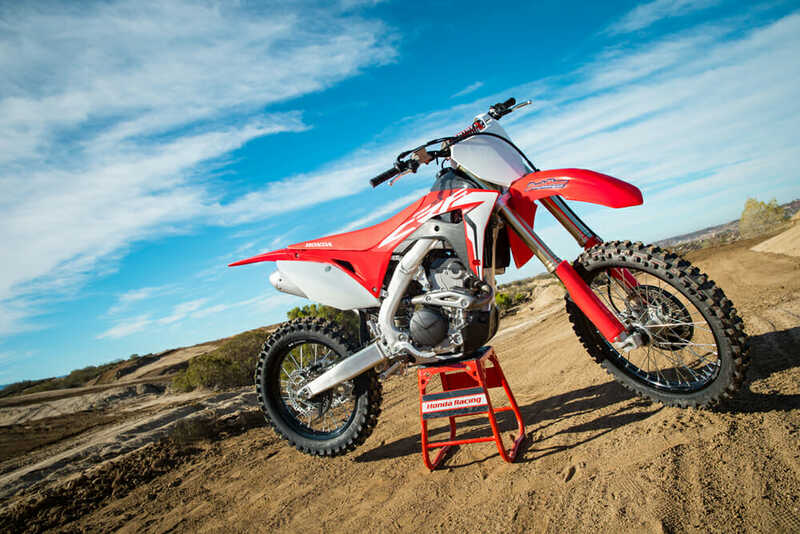 We rode the new Honda CRF250RX at the press launch that included a long, fun off-road single-track loop and two motocross tracks, all at our disposal courtesy of Cahuilla Creek MX—one of our favorite go-to spots for moto testing and just everyday riding fun. Ever since then, we’ve been spending more and more time ripping around on it, and we can say that we are really starting to like this little beast. Click here to read this in the Cycle News Digital Edition Magazine. You might think one would focus on the off-road side of the equation with bikes like the 250RX and ignore the jump-filled and crowded MX tracks. But the opposite is often true. These bikes, like the YZ250FX and KTM 250 XC-F, are right at home (some more so) in the spaces of aggressive track riding than they are battling bushes in the tight stuff or blitzing across the desert. This is especially true for the 250RX’s bigger and more powerful brother, the Honda CRF450RX. After all, both of these “RX” models are nearly identical to their “R” brethren with just enough changes to make them off-road capable at the racing level. In our first review of the 2019 Honda 450RX, we told you that bike is actually pretty tough to ride like a real trail bike. 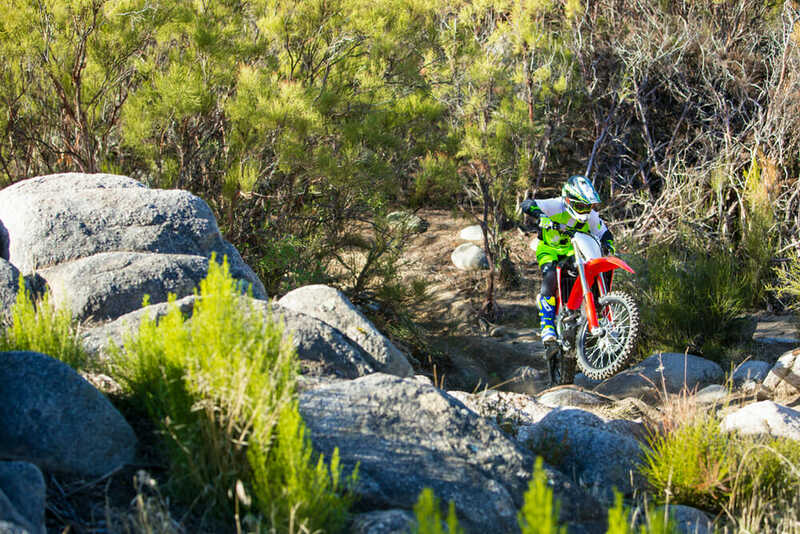 The fact is the Honda CRF450RX doesn’t want to be a recreational ride by design. It is a CRF450R with some off-road mods to make it a little more rideable and tunable for open-course racing such as WORCS, grands prix, desert racing and the like. Even back east at the fast and rowdy GNCC series in some tighter terrain, the 450RX is, and will be, a mighty handful for those brave enough to grab it and go. On the other side of the spectrum, the 450RX is an excellent track bike and an ideal choice for someone looking for a bit more versatility, fuel range and convenience (hello, kickstand!) in a one-bike garage. 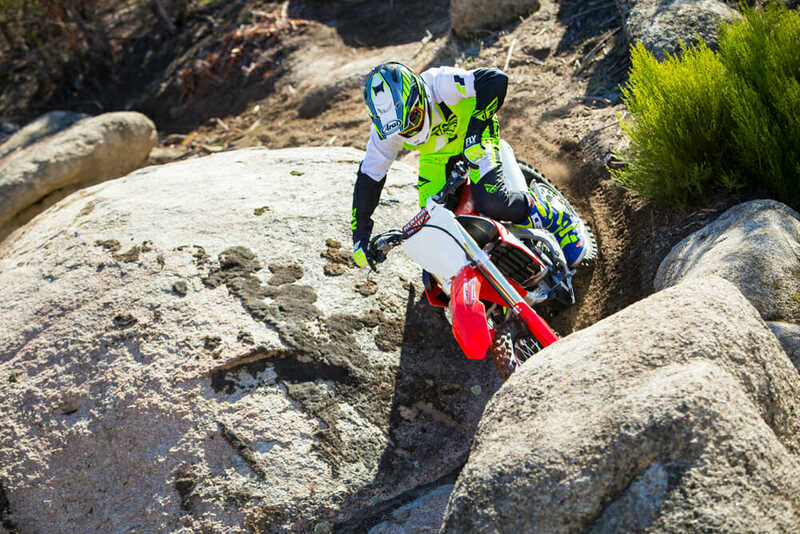 We raced the 450RX at the Elsinore Grand Prix, and it was a rocket in the hands of pro-level tester Ricky Yorks. He’s been riding the bike for months continuing to use it as his go-to track-day bike—we have a great update coming from him on his exploits of all things 450RX. On the flip side, anytime we ride it on tight single-track, it’s pretty much pissed off the whole time because it wants to go way faster than the terrain will often allow. Would the smaller-displacement 250RX feel the same way? The “X” stands for larger fuel tank, 18-inch rear wheel, a kickstand and a few more off-road tidbits thrown in. As you can see, it’s closely related to its MX CRF250R cousin. Yes and no. This bike flirts with the line between racing and recreation almost perfectly for people looking for a do-it-all dirt bike that doesn’t need a license plate. Surely a lot of this is due to its lower power output making it more manageable in more technical off-road scenarios and more fun when the trails get tight. 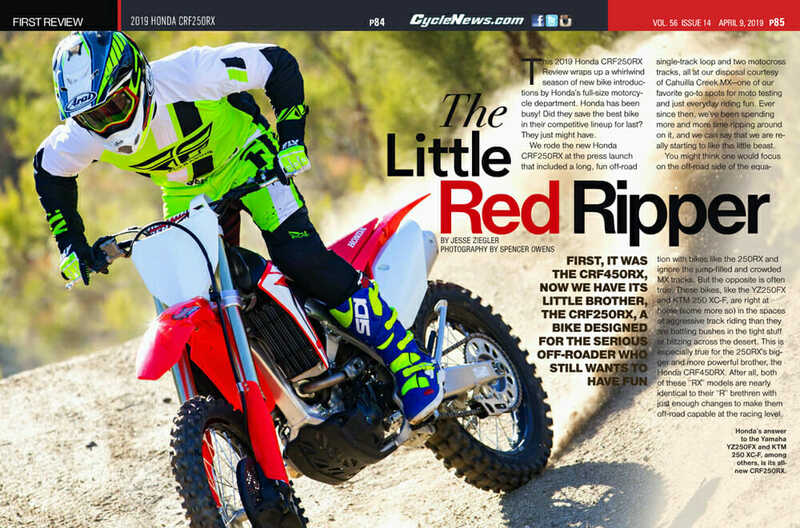 Johnny Campbell—clearly a man with his hand on the heart and soul of Honda’s off-road lineup, claimed the CRF250RX project was his favorite to work on during the recent Honda explosion of new models. His reason? He said because the bike is just enough lighter and more agile and more natural to ride than the 450 version. It just works better on tighter terrain and at race pace, and it is a lot more fun/engaging to ride. Plus, when the ground opens up, you can let it sing, and it still handles well. 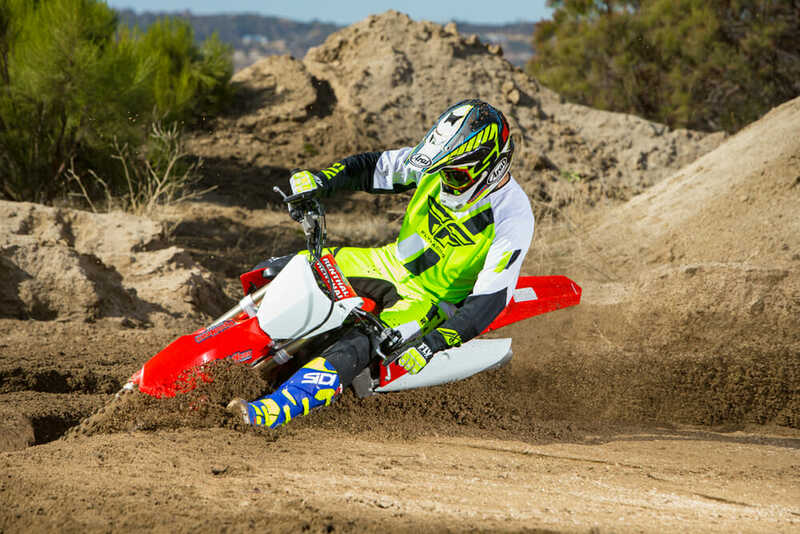 The CRF250RX feels right at ease both on the trail and on the track. As it is, the 2019 Honda 250RX has proven to be a pleasure to be on when aggressively attacking flowing single-track and the occasional nasty section. It has off-road manners even though it’s still an excellent motocross bike leaning on a kickstand. Off-road, the 2019 Honda CRF250RX is so much fun. Its light power delivery—compared to its bigger brother—encourages you to push harder to go faster, and the result is a ride that is both engaging and rewarding. Plus, it is a traction magnet. It also feels balanced, and the suspension adds to the confidence-building experience the more you ride it. Likewise, the power is just enough downplayed from the MX version that its reluctance to stall is admirable. Almost all of its 450-class brothers suffer from the dreaded pop-stall, the 250, not so much. It’s not going to win drag races against open-class bikes off the start, but while fighting in the same weight-class, this bike should prove itself competitive around a grass-track-ribboned course, or against the clock, thanks to its comfortable ergonomics and enthusiastic power delivery. It’s not the most powerful pony in the stable. Where it shines, though, is midrange, so tighter courses, where the bike can pull around in mid-to-top rpm will be ideal. This is sort of where you should be riding during a race anyway. The 249cc, DOHC engine with dual exhaust ports comes straight off the MX model. However, it’s been tuned for improved tractability at slower speeds. We played with Honda’s EFI mapping software. Honda’s ECU management system plugs into the bike and is housed on a laptop—not ideal for weekend warriors. It isn’t very user-friendly. With a few mouse clicks and a couple test sessions, however, we managed to breathe a little more life into the bottom end of the little RX, and we’ve kept it there ever since. The chassis and suspension package is damn near perfect for all-around riding. The suspension is tuned for a rider around 170 pounds and, at that weight, it soaks up off-road rocks and roots adequately. Ridden aggressively, it holds its own on everything but the biggest and fastest motocross obstacles and landings. For that, you can blame a spring-rate drop and dedicated valving that softens the front end overall, compared to the CRF250R. If you’re trying to ride the RX like its MX brother on the track, you will feel some limits from the suspension changes. First, it can wallow a bit on high-speed and big landings, or rollers, and the high-mounted fuel tank feels more awkward than a track-specific bike when full. In fact, one of the few complaints we had with the RX was its fit and feel because of the 2.2-gallon tank (the same is true on most of Honda’s longer-range models). It has a tough job holding off-road worthy fuel capacity on a bike with large perimeter aluminum frame spars. There’s just nowhere to go but up and that makes the weight of the extra fuel tall on the chassis. The shape of the tank isn’t terrible, but you can definitely tell when it’s full compared to when it’s down a half-gallon or so. The stock tank holds 2.2 gallons. Overall, the suspension seems to have a more usable range and reasonable adjustability than the new Honda CRF250R that the RX is so heavily based on, thanks to the forks. It seems that by opening up the movement via the new settings of the 49mm Showa spring forks makes them just a bit better at reacting to adjustments all around, even if they’re arguably too soft for full-on motocross competition. 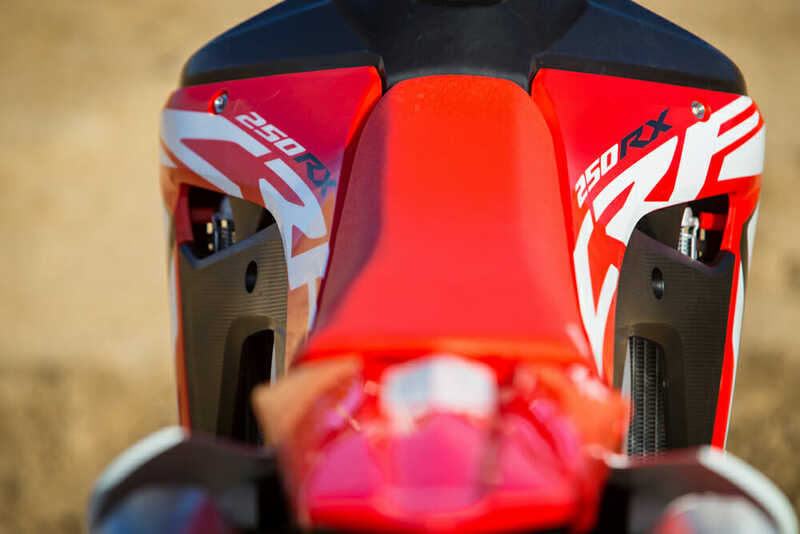 The 250R, on the other hand, has a hypersensitive suspension system that tends to react to small click adjustments on a bigger scale. The RX, however, gives you a little more wiggle room to experiment with, and that’s welcomed. The suspension is the same as the R model but designed to soak up the smaller bumps with more cushion. This is a race bike, leave no doubt. It doesn’t have spark arrestors in its twin mufflers, it doesn’t qualify for a green-sticker in California, and it’s 100-percent designed as a competition model. As such, it likes to race or ride at a race-style pace. There, it works better, as it should, and we love riding it aggressively. Why? Because it doesn’t scare the crap out of us. It just performs. What a novel idea! 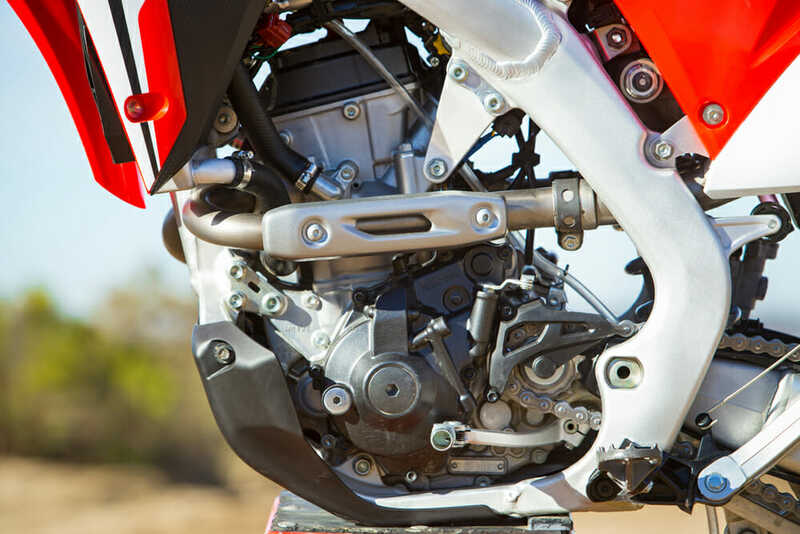 To prove it’s a race bike, the RX features every race-worthy component from the CRF250R. The programmable map switch with it’s blinking light is there, and it even includes launch control. The engine is nearly identical to the R with only specific ECU settings uploaded to give it off-road friendlier manners. The suspension components are similar, but feature revised front-end settings and spring rates for off-road. It shares the same frame, Renthal Fatbar, multi-position handlebar mounting triple clamp, black rims and a lot more with the R.
The more we ride the CRF250RX, the more we like it. The new Honda 250RX is an excellent motorcycle. If you’re looking to fill a hole in your garage, have a one-bike budget this year, don’t need a license plate to hit some off-road riding areas (once you slap on some spark arrestors), it’s worthy of your consideration. Things like the kickstand, the sealed chain, a bigger fuel tank and 18-inch rear wheel add weight, for sure, but the bike’s enjoyment isn’t hampered one bit. FRONT TIRE: Dunlop Geomax AT81 80/100-21 in. REAR TIRE: Dunlop Geomax AT81 110/100-18 in. RAKE/TRAIL: 27°18’ / 4.5 in. WEIGHT (curb, claimed): 244 lbs. Click here for the latest Cycle News Motocross bike reviews and news. Click here for more Honda motorcycle reviews and news.